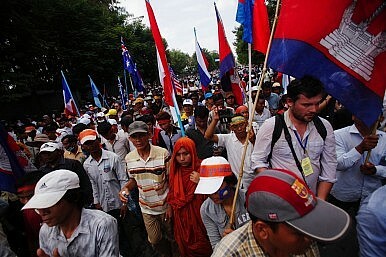 Cambodia’s political opposition has wrapped-up three days of peaceful protests and marches on foreign embassies, demanding international support for its push to have an independent inquiry conducted into the controversial results of the July 28 elections. The Cambodian National Rescue Party (CNRP) insists the ruling party of Prime Minister Hun Sen cheated at the poll, which gave opposition leader Sam Rainsy 55 seats in the 123-seat National Assembly, still a sharp improvement over its previous standing. Numbers were down, just 10,000 to 15,000 people gathered at Freedom Park in the capital, but were sufficient to panic the government and bring it to the negotiating table with promises of electoral reforms to be decided upon at an open forum to be held by December. Protesters were largely made up of impoverished villagers from the countryside. Gone were the tens of thousands of Cambodian youths who added a sense of fun and much color to the election campaign and delivered the CNRP its substantially improved result. The CNRP timed the October 23rd start of the three-day rally to coincide with the 22nd anniversary of the Paris Peace Agreements that kick-started the Cambodian democratic process but failed to end decades of war. That the United Nations and 18 countries that signed-off on the accord helped shaped Cambodia’s future and Sam Rainsy insists each now has an obligation to support opposition demands. Along with an inquiry the CNRP has also compiled a list of 10 items, including licenses for the establishment of their own radio and television stations and a ban on the granting of any more land concessions. Petitions with more than two million thumbprints backing their demands were presented following cross town marches to the UN and embassies from the United States, Britain, Japan, France, Australia, Indonesia, Russia and China. However, UN Secretary-General Ban Ki-Moon and key donor countries Australia, France and Japan have already congratulated Hun Sen on winning the July election while the Phnom Penh diplomatic corps, including the U.S., attended the inauguration of Parliament without complaint. Still the government threw an olive branch to the opposition. “The national-level workshop is really crucial for the election reforms and it helps strengthen the implementation of pluralist liberal democracy,” Minister of the Interior Sar Kheng said. Riot police were on hand amid fears of a repeat of the violence that occurred following a similar rally last month when one person, who happened to be walking home from work following the demonstration, was shot dead and several others wounded. The mood this time around was far more convivial with police deciding not to erect barricades or string out the razor wire.